will have its’ Missouri Premiere at the St. Louis International Film Festival on Sunday, November 23, 2014 at 3:00 pm in the Lee Auditorium at the Missouri History Museum. The film by Peter Roloff of maxim Films from Berlin will be part of the International traveling Exhibit and Book by the same title. The documentary shares the nearly forgotten story of the Giessen Emigration Society, which grew out of the early 19th Century turmoil and political unrest in Germany. Roloff pursues the story across Germany and the U.S. visiting locations, speaking with historians and descendants of the Society members. Theirs is a story of immigration at a time when the U.S. welcomed the refugees. In 1833, Friedrich Muench and Paul Follenius founded the Society, with the goal of creating a German State in America. In 1834, Follenius led several hundred on the Olbers into New Orleans, but lost nearly 100 after the group encountered Typhoid on the ship and Cholera coming upriver to St. Louis. Muench, whose ship had been chartered for Baltimore and sunk, had been forced to spend over a month waiting for another ship, before booking the Medora. The story follows the original 500 German emigrants who came in search of America’s freedoms. They were from large cities and small villages in Germany, were Catholic, Protestant, Jewish, Free-Thinkers and other religious backgrounds. They were not only teachers, lawyers, doctors and merchants; but farmers, blacksmiths and carpenters. The majority settled in St. Louis and directly westward in St. Charles, Warren and Montgomery Counties. They founded schools, churches and Societies that still exist today, such as the St. Louis Science Center. They left a legacy of industry, creating towns, churches and schools. 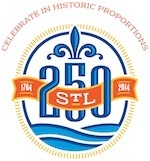 In St. Louis it is also part of the STL250 events, telling the story of our City’s German heritage.